Young filmmakers from Bradford saw their documentary films on the big screen at a special awards ceremony celebrating the success of the recent Community Film Skills Academy project. The event was the culmination of all the hard work put in by the teenagers and tutors during the free filmmaking courses for young people that were not in education, employment or training. I got the chance to talk to some of the project organisers and the young people that were involved in the programme. Zainab Jaffry, 19, got involved in the project because she realised it was a great opportunity: "I;m more interested in the presenting side and would like to do that as my future career so I enjoyed getting to know people that want to work in the same area of media as me." I recently visited a new ladies boutique on Leeds Old Road to interview the owner Rumana Rumi and take photographs for a business profile in the Asian Express newspaper. 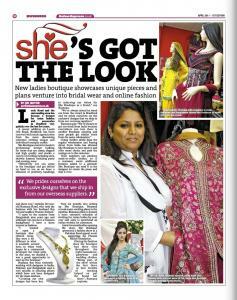 She Boutique showcases a range of unique accessories and clothing and is planning a venture into bridal wear and online fashion. 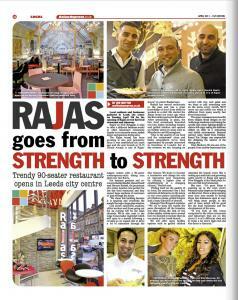 A new stylish 90-seater restaurant has opened in Leeds city centre and I went down to the launch event to chat to the owners and take photographs of what is set to be one of many successful Raja outlets. Featuring a contemporary design throughout, customers will enjoy dining in the spacious upstairs restaurant area. 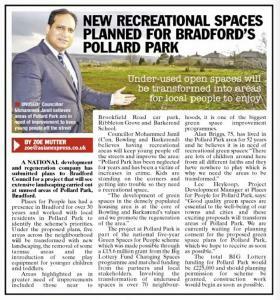 Councillor Mohammed Jamil (Bowling and Barkarend) met up with me recently to talk about plans that have been submitted to Bradford Council for a project that will see extensive landscaping carried out at unused areas of Pollard Park. He said: Pollard Park has been negalected for years and has been a victim of increases in crime. The development of green spaces in the densely populated housing area is at the core of Bowling and Barkarend's values and we promote the regeneration of the area." Volunteers from a Bradford charitable organisation are appealing for help as donations are drying up. 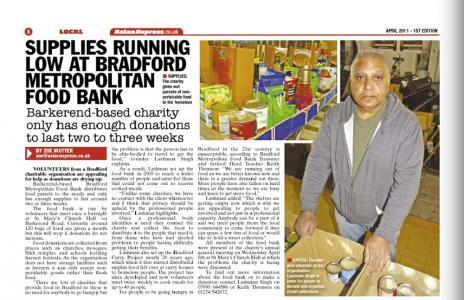 According to founder Lashman Singh, Bradford Metropolitan Food Bank only has enough supplies to last for two or three weeks after I met up with him in St Mary's Church Hall, the premises the food bank is run from once a fortnight. Lashman set up the food bank in 2005 to cater for those that could not come out to receive cooked meals. "Unlike some charities, we have no contact with the client whatsoever and I think that privacy should be upheld by the professional people involved," Lashman said. However, as the charity has become better known it has received a greater demand. More people have also fallen on hard times recently. "The shelves are getting empty now which is why we are appealing to people to get involved. Anyone can be a part of it and we need people from the local community to come forward if they can spare a few tins of food or would like to hold a street collection," Lashman explained. Business profiles make up part of the Asian Express newspaper and each one focuses on a different Yorkshire-based company. For a recent profile I interviewed a Chapeltown-based dancer, actress and model Deeba Amin. Alongside writing the text for her business profile, I photographed the multi-talented entertainer (which can be seen in the shots below). The 22-year-old rising star has been busy holding physical theatre and dance workshops for children and women in the local area. She is also preparing to go travelling at the end of the year when she will volunteer in India and incorporate some of her physical theatre and dance experience. Thanks to her unique style of dancing, which is a mixture of Bollywood, street and classical techniques, Deeba has attracted a lot of attention and is preparing to compete in the semi-finals of an international dance competition. Keen to continue dancing at events such as melas and share her knowledge with others through workshops when she returns from travelling, Deeba is currently promoting her brand Miz Diva. The memories of first generation South Asian migrants that came to Huddersfield over 50 years ago have been collated in a a book. I interviewed researcher Nafhesa Ali, who works in the centre for oral history research at the University of Huddersfield, to find out more about the project and how she documented the experiences of the first settlers of South Asian origin. Shakira Exclusive's dazzling collection of jewellery has proved popular with women looking for the perfect finishing touch for an outfit. 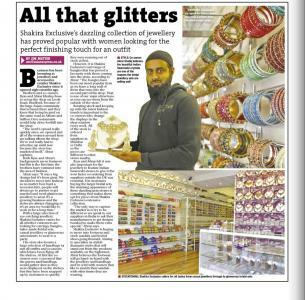 I met up with co-owner Abrar Khaliq to find out more about the jewellery and accessories retailer and take photographs for a business profile piece in the Asian Express newspaper. To read the full article, click here and head over to page 42. Front page - "Save the unit that helped my son"
I recently visited Leeds General Infirmary children's heart unit to interview a family there that would be affected if it was one of the units to close as part of the NHS's review of children's heart surgery provision across the UK. 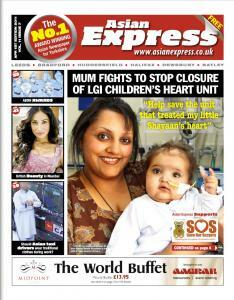 I went back for another issue of the Asian Express to speak to mother Nasreen Akhtar Suleman whose 14-month-old son Shayaan Ali is being treated there. Nasreen is another parent that is campaigning to stop the unit from closure. She travels from Halifax every day to be with her son and if she was forced to travel any further it would be very disruptive to her and her family's lives. "It has been a very difficult time and the doctors have said he is not going to make it many times. Adding to this with the worry that unit may close has not helped and there are many families in the same situation that come here every day to visit their sick children," she told me. 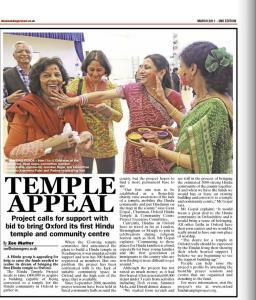 Earlier this month, I wrote an article about the Hindu Temple Project, which is aiming to raise money to acquire a building to turn into Oxford's first Hindu temple and community centre. Gyan Gopal, Chairman, Oxford Hindu Temple & Community Centre Project Executive Committee, told me that the first aim is to be established as a charity and raise awareness of the lack of a temple in the area which means Hindus in Oxford have to travel as far as London, Birmingham or Slough. So far the project has generated £60,000 in under three years from activities such as Holi events, Summer Mela and Diwali dinner dances. However, they have not raised as much money as they had hoped and are urging others to donate to the fund. Sometimes a particular story comes along that is best covered by getting out into the community and seeing what their opinion is. I recently heard that Pendle Council was proposing to introduce a new dress code for its taxi drivers in which men would be required to wear a smart shirt and trousers to work and women would have to dress in a similar smart manner. Some Asian taxi drivers in the area were angered by the suggestion of the new laws being put in place and felt that as they would not be able to wear the traditional dress (shalwar kameez), they were being discriminated against. Due to the objections from members of the Asian taxi driver community, the changes did not go ahead but I went out and about in Leeds to ask people if they agreed with the proposed dress code. Some of the views, which were gathered from a range of ages and from taxi drivers themselves were surprising and the overall findings were that 64% of people believe it is not acceptable for Asian taxi drivers to wear traditional clothing during work hours. A Maidenhead Rabbi has voiced his concerns over a proposed Sikh school in Slough. If the plans go ahead, the Slough Sikh Education Trust will set up a Sikh faith secondary school to help cope with the problem of a shortage of school places in the area. 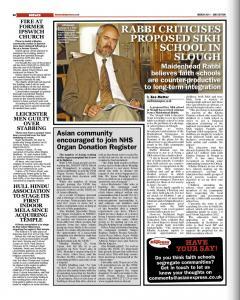 However, Rabbi Jonathan Romain believes that the Sikh community would become segregated if such a school was to open. But Rabbi Romain points out that he is in favour of faith but not of faith schools. In their defence, the Sikh Education Trust explained that the school hopes to attract half of its pupils from non-Sikh backgrounds. The generosity of some people is truly remarkable. Furhan Mustafa is one individual I interviewed recently who goes the extra mile to help others without expecting anything in return. The 21-year-old student from Manchester devotes his time to improving the lives of others in many ways such as organising days out for disabled children and influencing the development of local services. 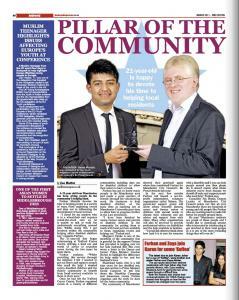 Furhan, who was nominated for the Good Neighbour award at the Manchester city council's Be Proud Awards, began volunteering at Trafford Carers Centre after he cared for his nephew who is in a wheelchair and need round-the-clock care. Margaret Clarke has shown her gratitude for the support Furhan has given her in caring for her sick husband Bill by writing a letter to the former Prime Minister Gordon Brown. In the letter, Ms Clarke pointed out the incredible difference the help had made to her and her husband's life. For many people, their home is an extension of their personality and a way to express themselves. 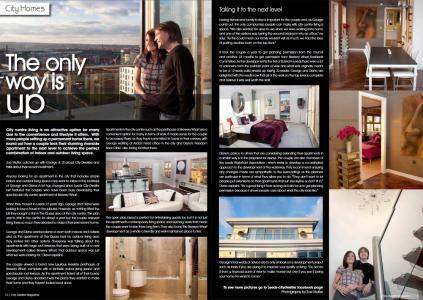 When writing and taking the photographs for a recent lifestyle article for Leeds City Dweller magazine I met a couple that have invested a lot of time into their city centre penthouse apartment. George and Diane have developed the property extensively since they purchased it. Stylishly decorated throughout, the apartment has a contemporary feel; from the elegant spiral staircase through to the stunning Italian artwork hanging on the walls. In the same week I had been reporting on cuts to council funding resulting in the closure of a local youth programme, it was uplifting to hear that cash had been awarded elsewhere in the region. 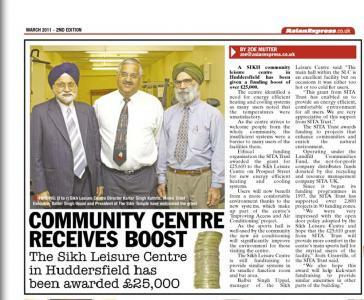 The Sikh Leisure Centre in Huddersfield received a boost of over £25,000 from ethical funding organisation the SITA Trust and I went down to chat to the centre director and chief executive and the president of the nearby Sikh temple. 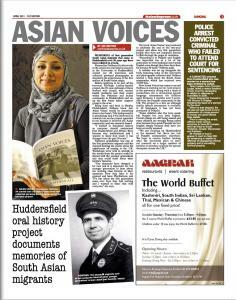 In the regional edition of the Asian Express I cover some of the goings on in courts in areas of Yorkshire. The recent case of Bradford police officer Kashif Ahmed caught my eye so I decided to get in touch for more information. 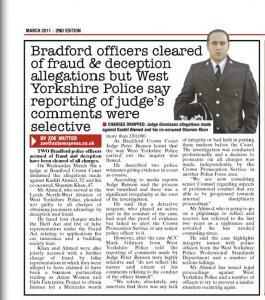 Mr Ahmed and his co-accused Shamim Khan were cleared of fraud and deception in March by a judge at Bradford Crown Court. The pair faced charges under the Theft Act and Fraud Act but Mr Ahmed, who had served at the Leeds North-West division of West Yorkshire Police, had pleaded not guilty to all charges. Judge Benson decided to dismiss the allegations made against the police officer due to the case being tarnishes by a significant irregularity at the centre of the investigation. ACC Mark Gilmore from Wet Yorkshire Police responded by telling me that reporting of the Judge's comments elsewhere in the media had been selective and that the investigation was conducted professionally and a decision to prosecute was made independently by the Crown Prosecution Service in Police Force area. A charity dinner was held recently (April 2nd) to help raise funds for the people of Pakistan. The event, which was organised by Islamic Relief, took place at Anams Restaurant in Bradford. Open to women only, the dinner raised money to rebuild villages that have been affected by the disastrous floods in Pakistan. I spoke to one of the event organisers and Islamic Relief volunteers Fatima Ayub about why the dinner is so important in promoting the work the charity does. "My aim is to motivate women to go into their communities and generate donations to rebuild one house costing £2,500," she said. "There is a real passion with women and as a mother of five children I know I would be devastated if I could not provide food and clean water for my family." Stunning photography and an exploration of the history of southern Asia's oldest and longest road was a recipe for success in a book recently launched at Manningham Library. 'The Grand Trunk Road: From Delhi to the Khyber Pass' looks at the important role the 1,500 mile long road has played in the process of migration and the industry that is still based in southern Asia. Anthropologist and historian Irna Qureshi was responsible for collecting the oral testimonies to accompany the stunning imagery from photojournalist Tim Smith. While speaking to Irna about the process of collating the book, she said: "One of my grandfathers was a clerk in the army in India. I discovered that the Grand Trunk Road played a large part in how my family first came to the UK." Cuts made to the amount of support provided by the council have affected many organisations. 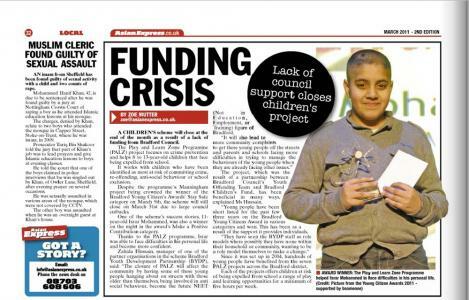 I recently covered the impact felt by a children's scheme that has now closed due to the lack of funding from Bradford Council. Children aged between 8 and 13-years-old have been helped by the Play and Learn Zone Programme. The scheme works with young people that have been identified at most risk of committing crime, re-offending, anti-social behaviour or school exclusion. Isara Mohammed, 11, is one of the programme's success stories. He has been able to become more confident, face difficulties in his personal life and was even crowned the winner of the Bradford Young Citizen's Awards' Stay Safe category in March. Zahida Hussain, manager of one of the partner organisations in the scheme believes the closure of the scheme will affect the community as young people will be more likely to get involved in anti social behaviour.